The Amazon dream of having drones deliver our packages is pretty exciting. But when it comes to the real promise of drone-based deliveries, nothing is more potentially transformative than the use of unmanned aerial vehicles for medical deliveries. 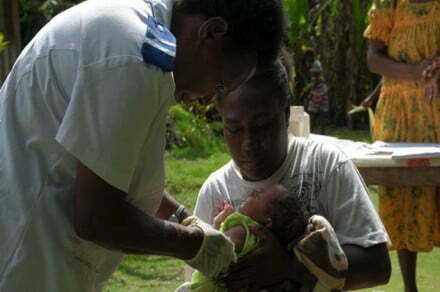 This month, that ambition took a huge step forward when a 1-month-old baby on a remote island in the South Pacific country of Vanuatu became the first person to receive a vaccine delivered by a commercial drone. The drone was flown by the charity UNICEF (the United Nations Children’s Fund) across 40 kilometers of rugged mountains, which would have taken hours to cross by more traditional means. The community the vaccine was delivered to is only accessible by foot or small boats, and does not have electricity or its own health center. Vaccines are notoriously tough to carry because they need to be kept at very specific temperatures. As a result of these challenges, around one-fifth of children in Vanuatu miss out on receiving what are considered to be essential childhood vaccines. Drones have previously been shown capable of safely transporting blood and even, as shown in a recent study, transplant organs. However, UNICEF claims that up until now no country had used a commercial drone company to transport vaccines to remote places in this manner. Two companies competed for the bid. In the end, it was won by the Australian company Swoop Aero. In order to win the contract, it had to prove that it was up to the job by flying a test payload a distance of 50 kilometers and then placing it down accurately within a small target zone. Given the recent achievement, it’s no surprise that the government of Vanuatu has expressed interest in integrating drone vaccine deliveries into its national immunization program long term. More broadly, it hopes to use drones to help distribute medical supplies.